This pedal is a relic from my playing around with guitar days, and is not a pedal intended for bass. 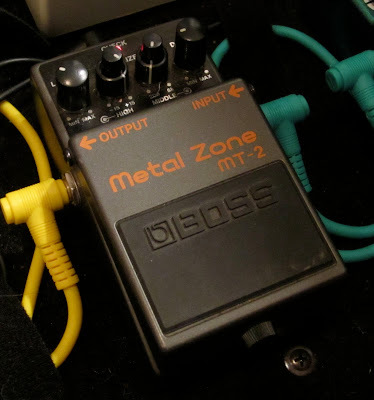 After doing not too much looking online, I discovered that the MT-2 is a pedal people either love or hate. I try to not get all emotional about my electronics. I've probably had this pedal for fifteen years, and I dropped over $100 for it at the time. Nowadays you can pick one up pretty cheap on eBay. If you are looking for a flexible fuzz type effect to play around with without dropping a big wad of dough, I think the MT-2 has a lot to offer. Videos are worth a thousand words. And you definitely have to say "Metal Zone" the way he does when you're talking about this pedal, preferably with a shriek of 80's hair-metal guitar from somewhere in the background. Rock on, MT-2. Rock on. that boss metal zone talks to my bass well!